Handmade in Israel of Mahogany wood, this tangram design is inspired by an ancient Chinese puzzle. It adds a sense of cultural fusion to the Jewish holiday of Chanukah. Invented in China during the Song Dynasty, the tangram is a dissection puzzle consisting of seven flat shapes, called tans, which are put together to form shapes. 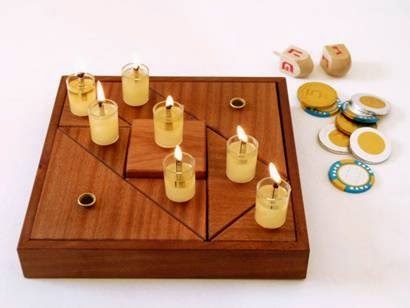 The objective of the puzzle is to form a specific shape using all seven pieces, which may not overlap. See NY Times article here. 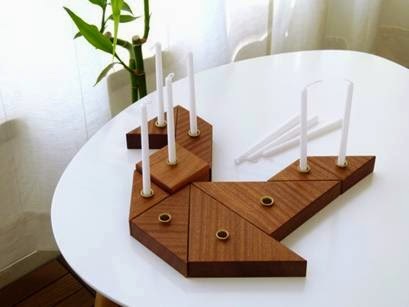 Read here why Studio Armadillo likes Chanukah so much, and view 8 of their innovative menorah designs. Studio Amarillo in Tel Aviv was founded in 1997 by Anat Stein and Hadas Kruk. In addition to designing for industry, they create independent art and design in the field of Contemporary Judaica. Find hi-res pictures of the tangram menorah here on their etsy site; press the zoom in the bottom of each picture and save the pic. Other menorah designs by Studio Armadillo on etsy here and here. Chanukah starts the evening of December 16 and ends the evening of December 24, 2014.